According to The Vault, rental rates for the facility start at $2,800 which includes up to five hours for the event, a choice of table sizes and shapes and 200 white-padded wooden chairs. There are additional charges for extended event hours and additional chairs. The Vault requires a minimum beverage guarantee of $4,900 and includes bartenders, barware and all alcohol and other beverages. There are four different beverage packages that range from $49 per guest for unlimited top-shelf liquor and premium wines down to $23 per guest for a choice of two domestic beers and two white wines. A separate non-alcoholic package is available for $20 per guest. The Vault welcomes all licensed caterers and will also provide an extensive list of caterers with whom they have previously worked. Caterers are required to provide linens, china and silverware. 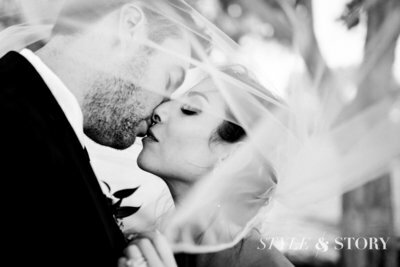 Style and Story Creative can help you capture every moment of your special event, from the rehearsal dinner to the last dance. For more information, please contact us. Banks built over a century ago were constructed to not only serve as a financial stronghold, but to also attract the finest customers in the area. The Vault's historical elegance is apparent today, even as guests cross the entryway. Marble floors and walls and original architectural molding lead the way as guests enter the grand ballroom, which is adorned with 40-foot ceilings and large window archways. The marble stonework continues up the grand staircase leading to a gorgeous light-filled balcony that overlooks the entire event space and offers a bird's eye view of the magnificent chandelier that serves as the room's centerpiece. The ballroom offers table seating or theatre-style seating for up to 300 guests. Below the balcony, you will find the original vault that can serve as a bar area for the reception or as a backdrop for the wedding ceremony. The room has been equipped with adjustable downlighting and sheer voile ceiling drapes to add to the dramatic decor. The vast ballroom can be utilized so that both the ceremony and the wedding reception can be held in the same event space. Smaller weddings have the option to hold the ceremony on one side of the room while offering table seating on the opposite end for the reception. Larger weddings can also be accommodated by setting up theatre-style seating for the ceremony and having the dining tables pre-set and lining the outskirts of the room, allowing the catering staff to quickly switch the room over for the reception. Built to house Columbia Building & Loans in 1912, The Vault is an impressive building that is not only rich in history but also architectural grandeur. Original features, including an authentic bank vault, adding to the distinctive setting that has been reimagined throughout its century-long existence. This five-story building became home to the Ohio Bell Telephone Company in the 1940's and was renovated to create a more business-friendly atmosphere, eliminating some of the authentic characteristics such as the vaulted ceilings, chandeliers and beautiful arched windows. In the early 2000's, many of its original architectural features, including the 100-year-old marble floor, were rediscovered and the building was restored to reflect its initial glamour. 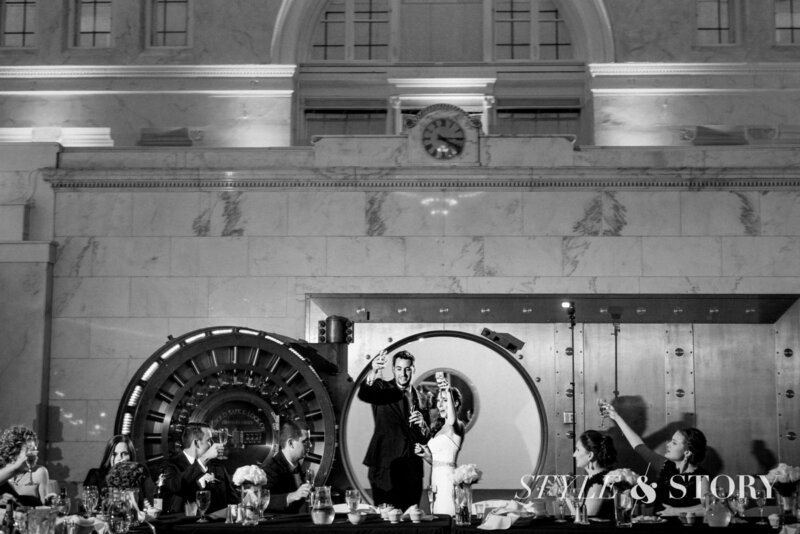 Click to see Tovah & Ryan's incredible wedding at The Vault. 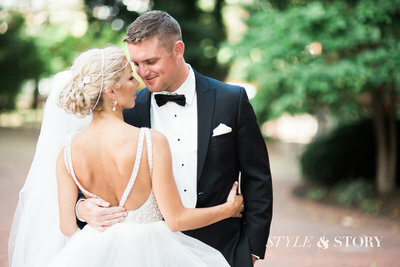 Click to see Kate & Bobby's incredible wedding at The Vault. 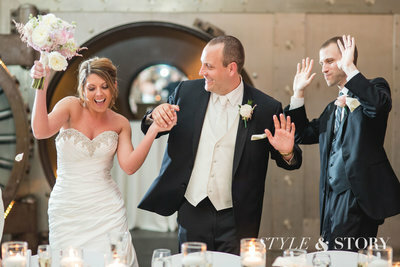 Click to see Erin & Caleb's incredible wedding at The Vault.